«©NCSX» The Biohazard 4 umbrellas were originally released with the Japanese Playstation 2 version of the game in 2005. Our records show that we received a total of 480 umbrellas and the shipping cost per unit from overseas was US$23.11 each. If we had known they'd be that expensive to ship, we would have refused them before they were dispatched and rescinded our preorder offer. 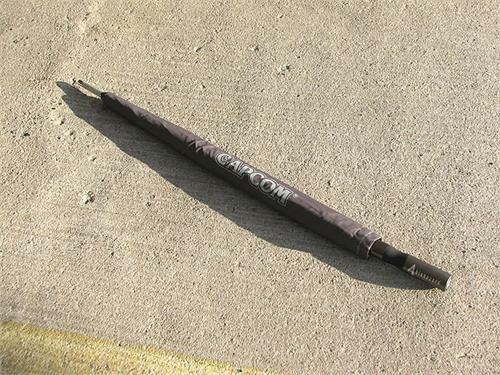 The umbrellas incur dimension weight shipping charges because of how lengthy they are. Fast forward a few years and the Biohazard 4 game is long gone but we still have a few boxes of umbrellas. We would prefer to sell the umbrellas for this much but it's unlikely we'd move many of them at that impressive level. We'll settle for for US$68.90. The umbrella shown on this page is our own umbrella which is from NCS' private collection. Customers who purchase an umbrella will receive a new unit from our warehouse which will be packaged securely to avoid potential dents and dings during shipping. Due to the collectible nature of this item, we'll do our best to make sure it arrives to customers in factory fresh condition. The umbrella was too large to photograph indoors so we hustled it out to the building's parking lot for today's snapshots. One of the codgers down the hall also told us that opening an umbrella indoors was bad feng-shui. NCS' remaining inventory of the Biohazard 4 Umbrella is new and in mint condition. Pricing is set at US$68.90 per unit. Due to the size of this item, please note that we will ship each umbrella within a durable cardboard tube. Larger Photos.